I stumbled on the site mymorningroutine.com and love it. Probably because I love the morning and it’s cool to see how other people start their day. For fun, I thought I’d answer the questions from their site. On weekdays my iPhone alarm goes off at 5:30 and if it was a good night, I am awake in time to catch it before it sounds. I usually check Instagram, Facebook and the Weather Network app and then roll out of bed by 5:40. I throw on my running gear and am out the door by 5:50. Henry (dog) comes with me for a 2km loop and then I drop him off and continue running. Most runs are 5-8km on weekdays and I try and get 3-4 runs in during the week. (On the days I don’t run, we walk about 2km). 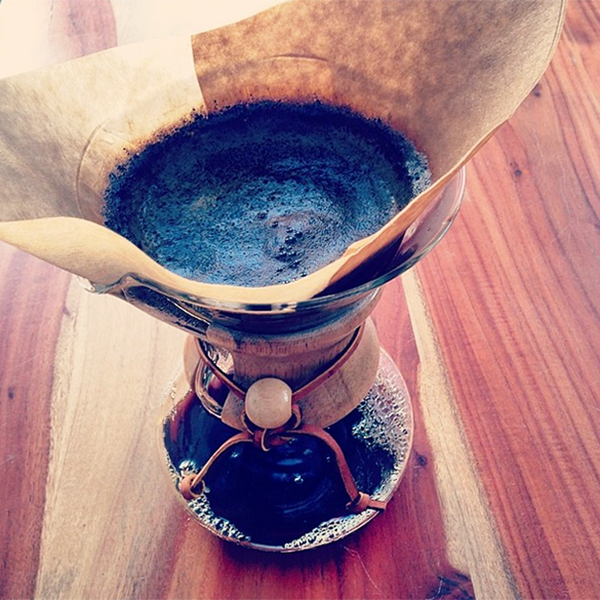 Once I get home, I turn on the kettle and grind my coffee for the Chemex. When the coffee is made, I go upstairs to shower and get ready. This is around 7am when Mike and David are waking up. While I am getting ready, they eat breakfast and then David and I hang out until 8:30 – I’ll try and sneak in a bit of work or publish a post, pack David’s school snack and grab a bite to eat. At 8:30, David, Henry and I walk to school. I’m usually home by 9:05 to start my work day. My office is upstairs and I’m lucky to have a space I love working in. This routine has been going on since September when David started school. I would prefer to start work earlier but it is nice to take the time to walk to school together. With my ‘temporary office job’, I occasionally go straight to the office after the school drop-off but that means Henry doesn’t get to come with us. B.D. (before David), I still got up early but, I started my work day at 7:30. It was amazing to get a big head-start – especially because my Montreal office is an hour behind. It depends on the day – if I get a chance, I will eat before I walk David to school but if things are hectic, I’ll eat breakfast in my office at 9:00. It is usually yogurt and granola but I am trying to eat more oatmeal. I will have eggs 2-3 times a week – a must on the weekend. Breakfast however, is never skipped – it’s my favourite meal of the day. Running. I love running first thing in the morning and am really bad at running any other time in the day. I always feel better when I get a run in. It’s like coffee, before the coffee. Do you answer email first thing in the morning, or leave it until later in the day? I’m really bad at ignoring email but I am trying to make it less of an instantaneous thing. I’ll check email as soon as I wake up but I do not reply until I start my work day. I don’t have any sleep apps but I do check the Weather Network right away. I use the Nike+ running app for my morning run. Right away. I want to get a proper alarm clock and move the phone out of my bedroom. (Truth: I can not sleep in a room without a clock. I need to alway be able to know what time it is – day or night – which is why I wear a watch every day.) One thing I recently changes is turning my phone to ‘do not disturb’ from 10:00pm to 7:00am so I am not distracted by incoming notifications. What are your most important tasks in the morning? Getting David to school on time. I always put a glass of water on the front patio when I go for a run and drink it as soon as I get home. I will then have 2-3 cups of coffee in the morning and go back to water at lunch. I am terrible at keeping hydrated. On weekends, if it is my day to get up with David, it is usually around 7:00. When the weather is nice, I can convince him to take Henry to the park while Mike sleeps. It’s the best. On the day I “sleep-in”, I usually opt for a long run instead. I’ll be out the door by 7:30 and have breakfast (eggs) and coffee when I get home. Yes. I almost always pack my running gear and I hate sleeping in. I don’t deal well with disorder or unplanned events. I need my run, I need my coffee and I love routines so my day will be affected if things fall apart in the morning. I really REALLY love the morning and want to make a point to change things up and enjoy the time more. I am excited for warmer weather, when the early morning running and school-walking will feel like less of a chore. This winter has been rough! I have never felt so unmotivated and I am eager to get back to my happy morning place. I want to make an effort to work more like a freelancer in the future. I tend to glue myself to my office chair all day and need to soak up more sun and backyard this summer. After all, it is a perk to being self-employed! Let me know if you are a morning person too!